NEW YORK (AP) — Caris LeVert’s injury wasn’t as bad as it looked. That’s far better than what was feared when LeVert’s leg appeared to bend in a gruesome manner after he leaped to block a shot in the final seconds of the first half of Monday night’s game in Minnesota. “While the optics of this injury may have appeared to be more severe, surgery will not be required,” team orthopedist Dr. Martin O’Malley said in a statement. O’Malley examined LeVert on Tuesday at the Hospital for Special Surgery and the third-year swingman was diagnosed with a subtalar dislocation of the right foot. O’Malley said there was only moderate ligament damage and that following a period of rehabilitation, LeVert was expected to return to full strength and resume all basketball activities without any limitations this season. 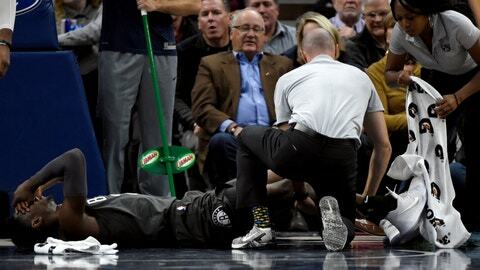 LeVert’s injury initially appeared similar to the severe leg injuries suffered in recent years by Paul George and Gordon Hayward, and players prayed and some were in tears as a stretcher was brought onto the court to take LeVert to a hospital. LeVert posted his own message on Twitter on Tuesday night, thanking people for their prayers and support. “I just want to thank God above all things b/c despite how bad the injury looked, it could’ve been a lot worse,” he wrote. LeVert, who battled foot injuries in college at Michigan before emerging as a first-round pick, had been the Nets’ best player during their promising start. He is averaging 18.4 points and is the only player in the league this season to convert multiple go-ahead baskets with less than 10 seconds remaining in regulation or overtime.